The following tanka is dedicated to the courageous people who participated in the “Moral Mondays” in my home state of North Carolina. They risked arrest for gathering at the State Legislature to protest unfair and discriminatory legislation being passed. These protests were non-violent and led by the Reverend William J. Barber. THE DECORAH EAGLES…JOIN THE FAN CLUB! The eagles landed some time ago and have carefully rebuilt and replenished their nest. I am referring to the now famous Deborah Eagles out in Iowa. 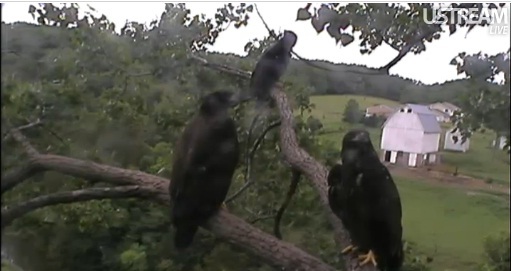 For several years now, I’ve been one of their fans watching the live camera feed. The first egg has been laid, and the camera is showing mom sitting on it as the wild winds blow past here high up in a cottonwood tree. 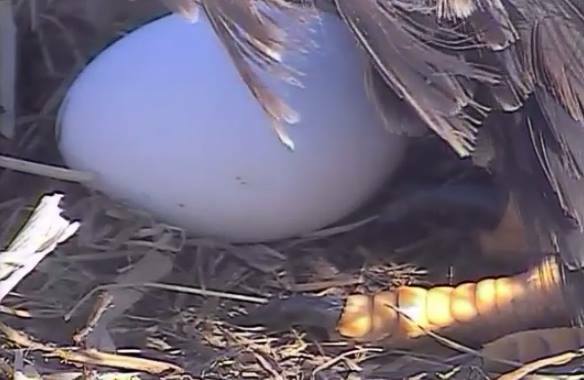 The first egg was laid a day ago. It will hatch in 35-39 days if all goes well. Watch it, if you dare. You just might get hooked on this fascinating bit of eavesdropping. 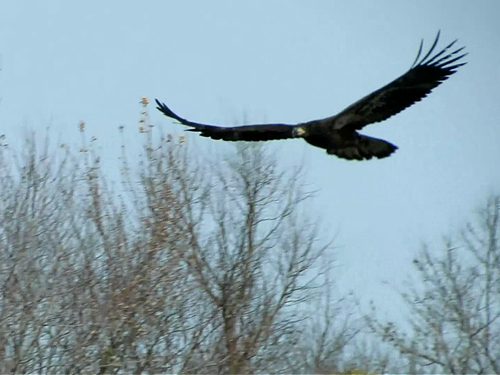 Bob Anderson, the founder and director of Raptor Resource Project, operates the organization from the town of Decorah. 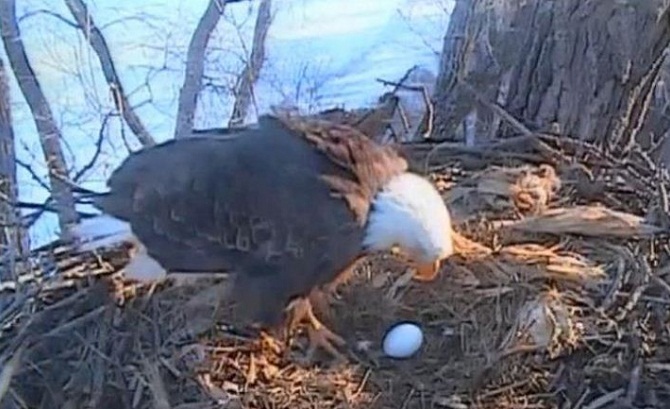 For more information about the Decorah Eagles, browse to their UStream live camera link, and scroll down below the camera feed. You will find many links, with lots to read about them there. I first watched them in 2011 and was fascinated by the eagles but also by the avid eagle watchers. I learned more about eagles and raptors than I thought I would. For instance, this first egg that was just laid will hatch in 35-39 days. 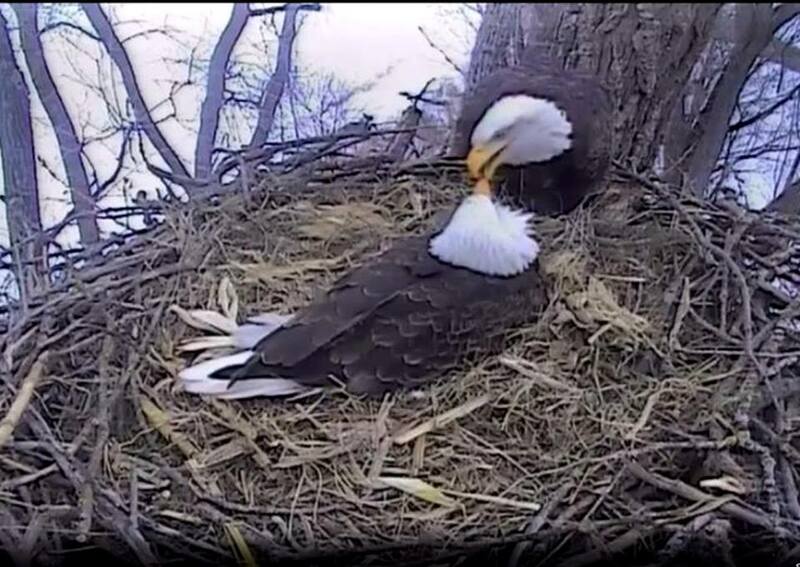 These particular nesting eagles have been very successful, very attentive parents. If you have children or grandchildren, nieces or nephews or if you teach, I can’t recommend this more highly. Technology gives us a beautiful glimpse into the world of these powerful, beautiful birds. And, since this is my poetry blog, here’s my poem that I wrote for the first eagles I watched learning to fly. Hard to imagine that they need to “learn” but they do indeed. My poem is dedicated to the eagles. Understanding now what it would be like to fly. That once it had made that leap, it too would fly.